1200 lb weight capacity raised toilet seat. 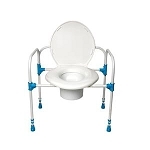 Heavy duty folding, adjustable height bedside commode. 800 lb weight capacity raised toilet seat.